Will McDonald's Raise Its Dividend in 2017? Things have looked up for the fast-food giant. Will its impressive string of dividend increases continue? Fast-food giant McDonald's (NYSE:MCD) has survived and thrived for decades by giving restaurant-goers what they want. That strategy has paid off for long-term investors, as the stock has produced average annual returns of 14% over the past 40 years. Dividends have played an important role in McDonald's total return, and shareholders have come to expect an annual boost every year from the fast-food chain. Yet some wonder whether McDonald's can sustain enough growth in its bottom line to support dividend increases indefinitely. Let's look more closely to see if McDonald's is likely to raise its dividend in 2017. McDonald's is no stranger to dividend growth. The company qualifies for the prestigious Dividend Aristocrats list, having exceeded the quarter-century threshold for consecutive annual dividend increases more than 15 years ago. For decades, the regular dividend increases that McDonald's made were significant, and the resulting growth compounded dramatically over time. More recently, McDonald's dividend growth accelerated in the mid-2000s. The dividend quadrupled within just a four-year period, and even as most companies were cash-strapped, McDonald's made a 33% dividend boost at the height of the financial crisis in November 2008. Even after that long streak of lightning-fast increases, McDonald's kept giving shareholders double-digit percentage dividend hikes for several years thereafter. MCD Dividend data by YCharts. Note: McDonald's made annual dividend payments from 2002 to 2007, which make the dividends for that period look four times larger than the remainder of McDonald's dividend history. Why have McDonald's dividends climbed less steeply lately? Since 2013, however, McDonald's has slowed down its dividend growth. Increases have been in the 5% to 6% range for four straight years. The main culprit has been a tough period of sluggish earnings performance for McDonald's. Net income fell 20% between 2013 and 2015, and that has forced the fast-food chain to use a larger portion of what money it has earned to sustain dividend growth. McDonald's payout ratio has risen from under 50% in 2011 to more than 70% by 2015, and its current level is consistent with that trend as well. Moreover, some are concerned about the level of leverage that McDonald's has taken on. Long-term debt has risen from $15 billion in 2014 to $26 billion as of last September, as the fast-food chain has made massive stock repurchases that have cut its share count by more than 130 million shares, or roughly 14%, over that period. Yet there are positives for McDonald's as well. The move to offer all-day breakfast has re-energized the restaurant company, bringing customers in not just to buy those items but also to make them part of larger meals incorporating both traditional breakfast foods and lunch and dinner items. That has helped contribute to five straight quarters of growth in comparable-restaurant sales, and in some markets, McDonald's is gaining market share over its competitors. Also, McDonald's understands how essential the dividend is in the eyes of many investors in the stock. 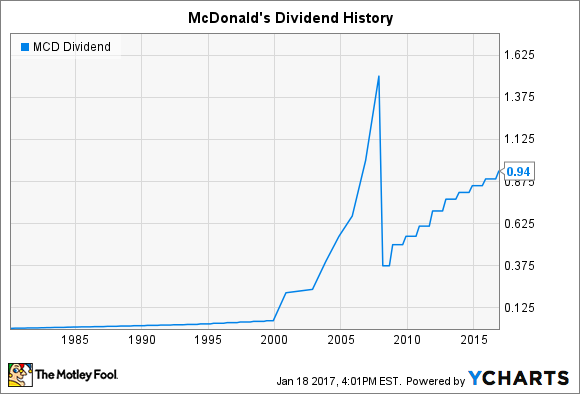 As CEO Steve Easterbrook said at the McDonald's annual shareholder meeting last year, "We know the dividends are a very, very important incentive to our shareholder base, and we have an unblemished record of increasing that dividend every single year since we've been paying out dividends." Because of this, McDonald's will almost certainly find a way to raise its dividend in 2017, with the most likely increase being in the $0.05 to $0.06 per share range. The lower amount would be in line with the percentage increases in recent years, but a $0.06 raise would bring the quarterly amount to an even $1 per share, and McDonald's might find that round number attractive. Regardless of the amount, McDonald's investors should keep their eyes open for a boost to the dividend that's most likely to come in November.